There are several interesting things about this Vanguard XT-Classic caravan. From the outside, the most obvious is that, unlike many modern vans, it has only a single axle. 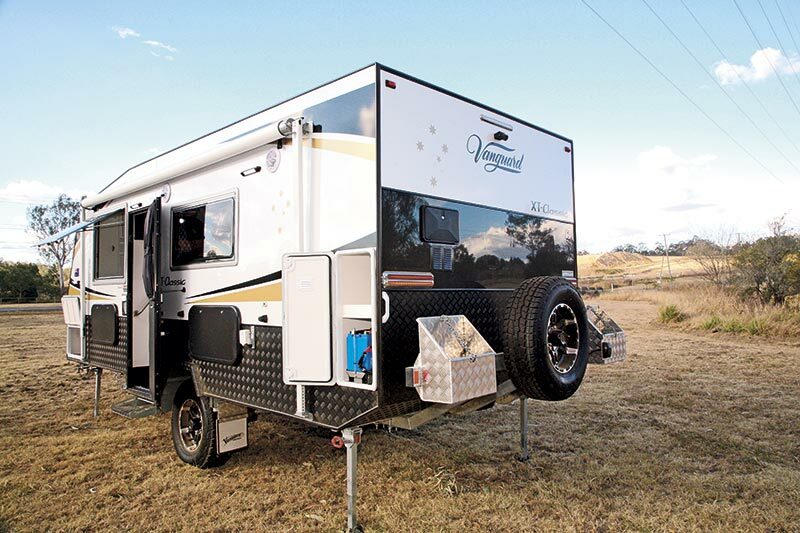 In addition, the 150mm (6in) drawbar and liberal use of protective plating give the clue that this could be a rough-road caravan. 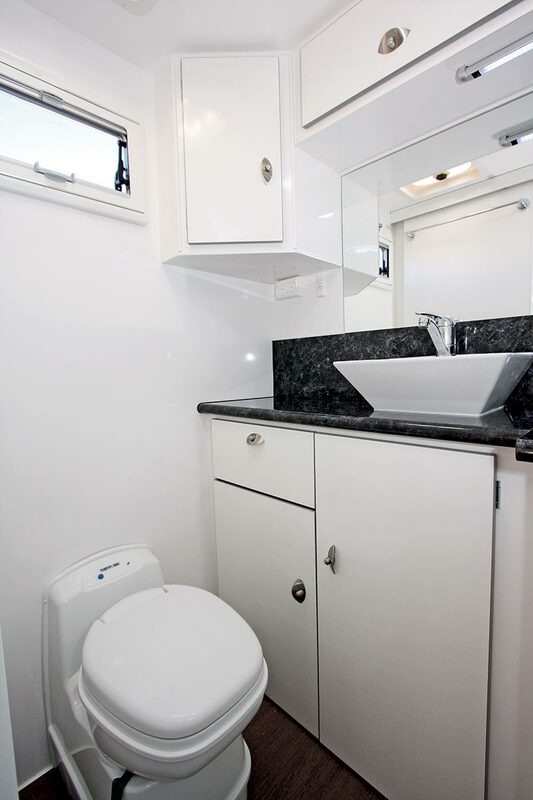 Inside, given the external body length of 5.7m (18ft 8in), the surprise is that the designers have managed to squeeze in a front bedroom/full-width rear bathroom layout. The latter has been achieved through the use of a centre entry door. 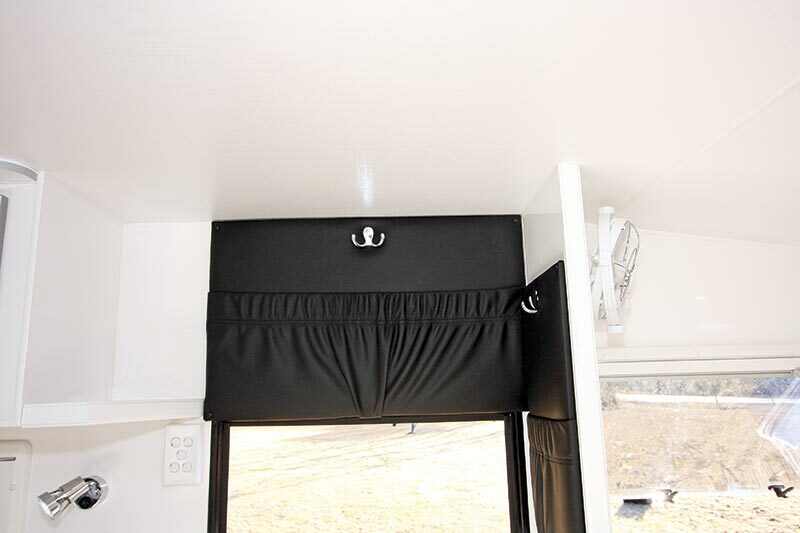 Being in front of the axle, the door’s position creates a bit more space around the bed while still allowing for a nearside dinette and offside kitchen bench. There is a hot-dipped galvanised chassis with 100mm (4in) rectangular hollow steel (RHS) main rails and 50x50mm (2x2in) cross members. 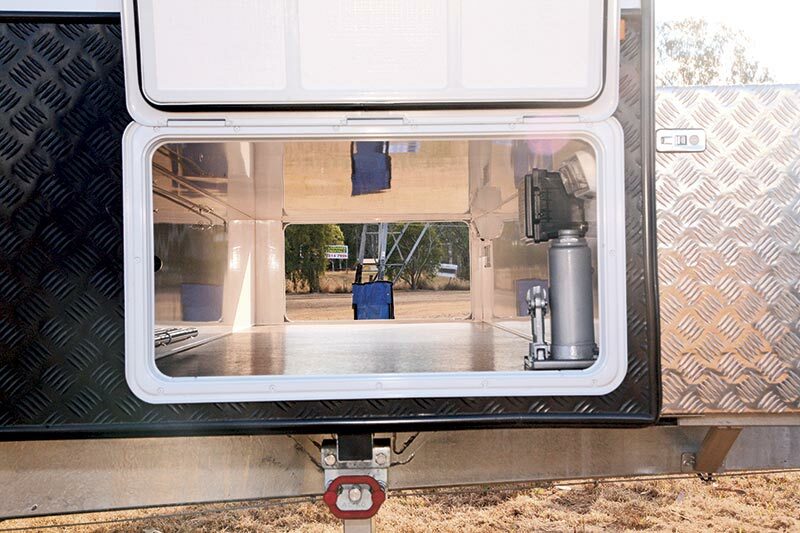 Underneath the main section, the 150mm drawbar rails extend rearwards to the entrance. Behind that, under a 50mm riser, is the independent suspension with trailing arms, coil springs and twin shock absorbers on each 16in alloy wheel, the latter also fitted with 12in electric brakes. 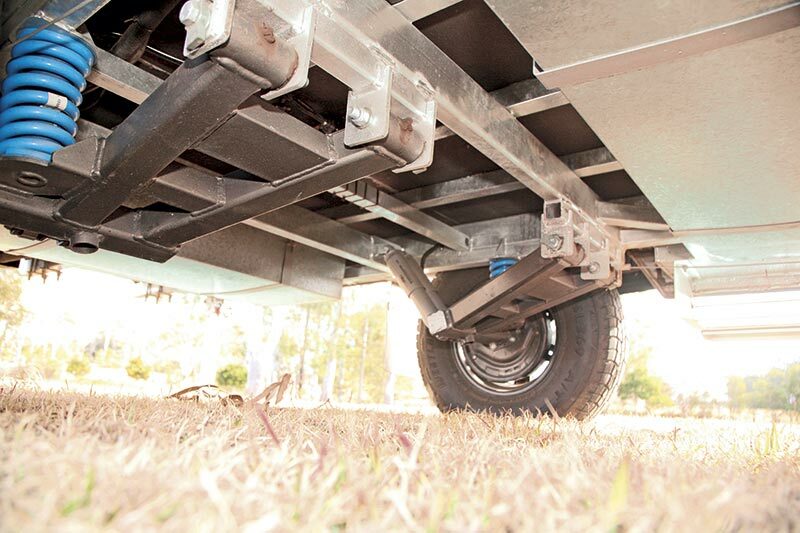 Underneath the chassis, twin 95L water tanks are fitted either side of the axle and are protected by galvanised sheeting. Most of the pressure water piping and drainage hoses are strapped up out of the way. 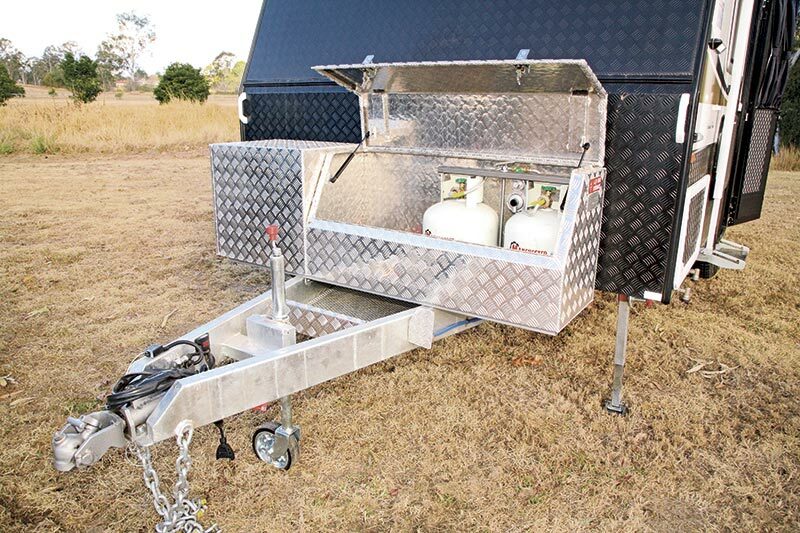 An unusual feature here is the checkerplate-protected water pump that is mounted underneath the front section of the chassis – usually, the water pump is mounted inside the van. Inside you’ll find a contemporary layout, finished predominantly in white with black upholstery and black marble-look benchtops and splashbacks. One thing about bright interiors is that natural light is not an issue. Large windows help even further, as do the two Four Seasons hatches. Several points of note around the doorway are the key and coat hooks above and beside the door, as well as a small shelf above the dinette. If you start looking mid-van, the kitchen bench is of a shorter length that seems to be quite common, even in larger vans, these days. 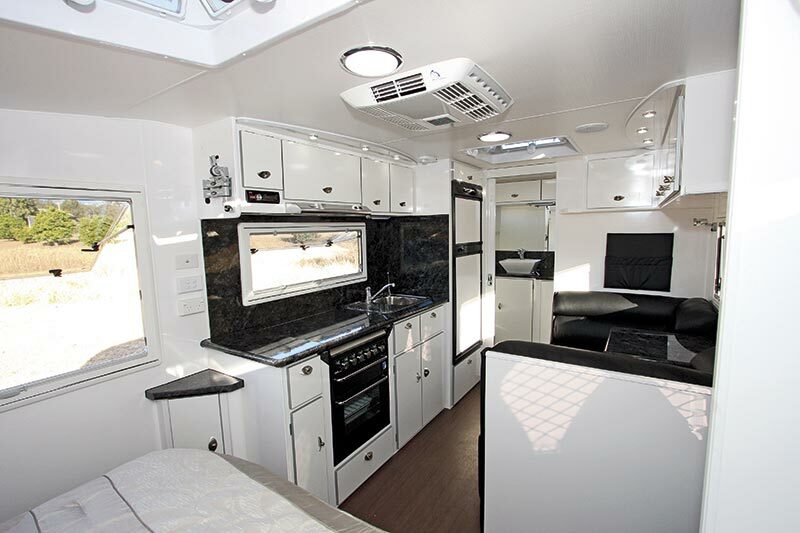 A stainless steel sink and drainer sit alongside a four-burner cooktop/grill and oven. 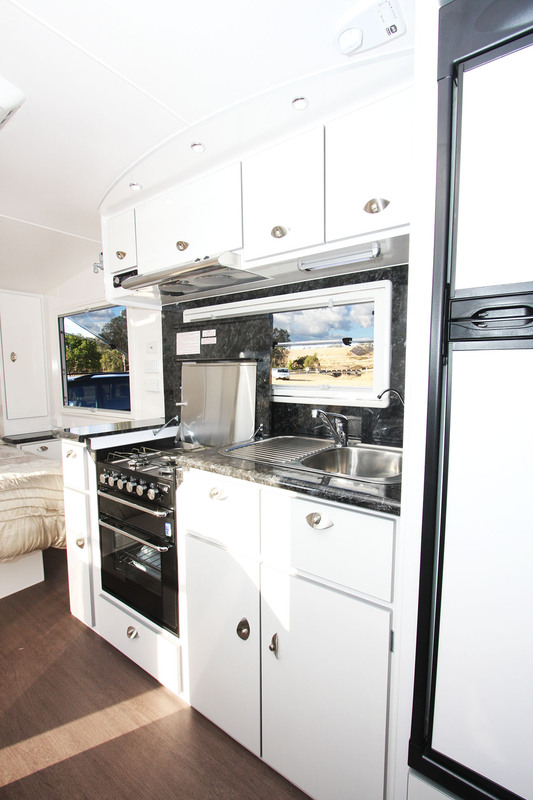 The latter has a flush top which aids the small worktop area towards the front of the van. The fridge, is a Thetford 184L three-way model and it sits between the bench and the bathroom wall. A little surprisingly, there is no microwave but I suspect one could slot quite neatly into one of the overhead locker spaces. 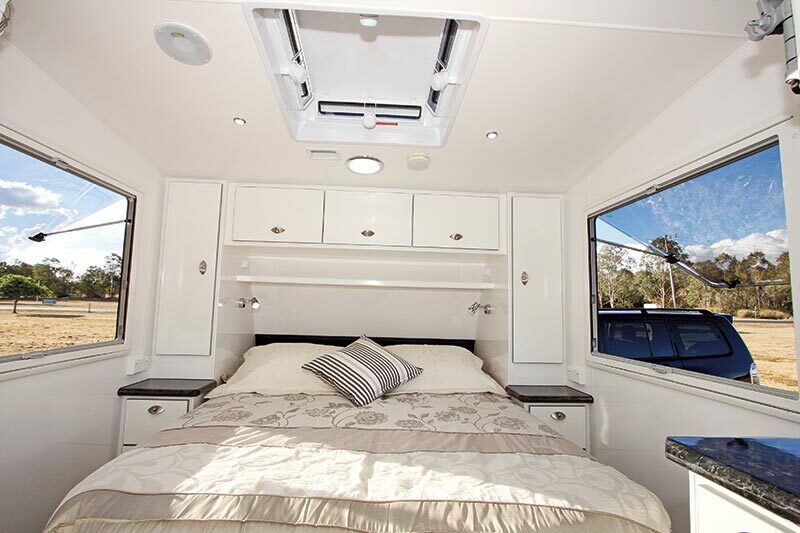 Given it’s relatively short length of 5.7m (18ft 8in), the Vanguard XT-Classic is well fitted out with all the current expected luxuries. Naturally, some areas have been squeezed a bit to fit everything in but it’s all very liveable. In addition to all of this, the maximum loaded weight of the van keeps it under the 2500kg towing capacity of many popular tow vehicles, such as the Prado.